It has been a long winter for us in the South we were are not use to this cold wind, snow, sleet, and freezing rain. Our pastures are not enough for the pregnant girls. They are eating more hay than ever. Ready for the green pastures of Spring. As a new alpaca farmer, I have learned a few things quickly over this long winter. First, do your research and be prepared before the weather comes. 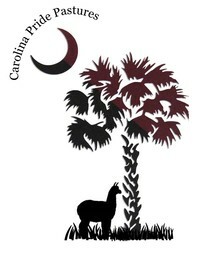 I have found that AlpacaNations website and community forum is excellent for advice and tips. Secondly, water is key. Since we don't get freezing weather for days on end normally, so we initially did not buy heated buckets. Before the first cold snap, my husband bought us one. It has been a great investment. For about a week, the only bucket that would stay thawed was that one. I would boil water in the morning to thaw the buckets but by evening, they had frozen again. The girls were using the heated bucket almost solely. I was refilling some times twice a day. The dog liked it too!!! Another key element with water is temperature. It is cold so you would assume the girls would drink less. In fact, they drink as much on a super cold day as they would on a super hot day. 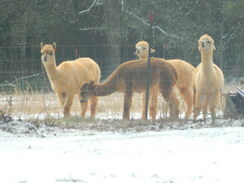 If you want keep health alpacas in the winter, keep water available. The key is the water needs to be between 50 degrees and 80 degrees. I observed their liking of lukewarm water first hand. I had one bucket that was thawed by the sun. I had another bucket that I had thawed with boiling hot water. That bucket was emptied first. Extra hay is not going to hurt them on cold days. I have found that giving them a little extra before the super cold weather comes helps in their ability to stay warm. They may not eat it all but use the extra as bedding. Sure it makes for a messy barn but Spring will arrive soon. If you want, to invest in some bedding straw, that is great. Our barn floor is red clay. It gets cold if the sun does not hit it. A cold floor makes a cold alpaca. Leftover hay or bedding straw is a great item to have down to prevent a chilly animal. Finally, our biggest battle is the wind. I was so worried about the cold temperatures that I did a lot of research on the weather. 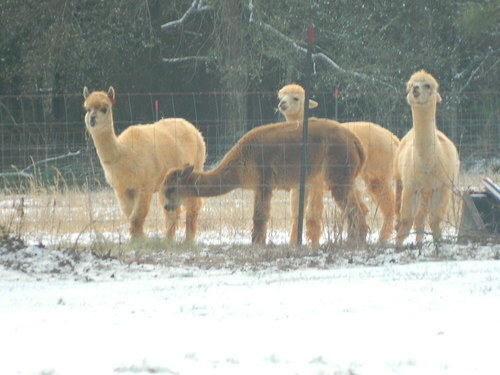 The biggest thing I found is an adult alpaca can hand the cold temperature as long as the wind is not screaming. Their fleece is at almost full blanket so they are very warm. If the wind is blowing, the cold weather can penetrate the blanket and make them cold. A shivering alpaca is not good!! Get an old sweater on them ASAP. We have wrapped our open area of the barn with plastic so that when we put the girls up at night, the wind is off of them. A cheap solution to a dangerous issue. Spring is coming soon Thank God! We have a filled ready for planting and are starting to see a little green in the pasture. The crias are due April 30th. Watch our website for updates and pictures!! !